Everybody loves watching cute and silly cat videos online. If you’re familiar with getting lost in a sea of cat videos on the internet, you probably remember when a lot of footage was surfacing of cats freaking out when they saw a cucumber. Ever since those videos became popular, everybody has been wondering the same thing: are cats actually afraid of cucumbers? And if so, why are they afraid of cucumbers? There has been a lot of research into this topic, and many experts have weighed in and given their answers. Even so, it seems that not everybody can agree on a true reason why cats seem to always jump at the sight of a cucumber, but there are some pretty solid theories that can help us figure it out. One thing’s definitely for certain, though: don’t scare your cat with a cucumber! One thing to keep in mind is that it seems like not all cats are actually scared of this vegetable. While some may not even flinch at all, others jump a mile high and hiss and scratch at the cucumber that was placed behind them. That also introduces another aspect of these pranks: the cucumber is typically placed behind the cat when they’re not looking, so they are unaware that it has been placed there. This means that when they turn around, they are surprised by the unidentified object (the cucumber). Another pattern that can be seen in many of the videos is that the cucumbers were placed behind the cats while they were eating. This in itself could provide a worthy answer to the question at hand. In fact, Mikel Delgado, a certified behavior consultant for cats who received his PhD from the University of California, even said that he doesn’t actually think that the cats are afraid of the cucumber itself. The aspect of surprise may end up being all there is to it. Some people think that the root of the fear could come down to instincts that have been instilled in cats since wild times, when they were left to fend for themselves in the wilderness. If a cat is unfamiliar with cucumbers, seeing one for the first time might remind them of a snake. As you probably know, snakes are pretty dangerous, and cats probably aren’t thrilled with the idea of a snake suddenly appearing behind them. This theory has actually been backed up by Jill Goldman, a certified animal behavior specialist who once did an interview with National Geographic on the subject. 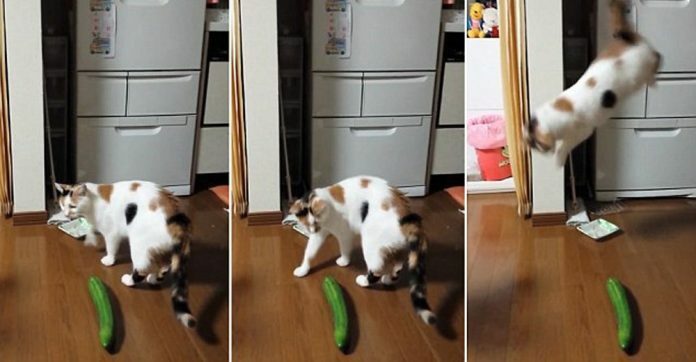 Although it may be an uncommon theory at this point, some people do still think that cats are simply afraid of cucumbers. Some people have argued that it could be the smell of the cucumber. One commenter said that the smell could tip the cat off that the skin is poisonous, while another person stated that the smell of a cucumber resembles the smell of a copperhead. The experts aren’t too sure about the truth of either one of those statements, but the evidence seems to point to an entirely different theory as to the true cause of this fright. After all of the different theories have been discussed and countless experts have weighed in on the subject at hand, it seems that the truth has finally been uncovered. At the end of the day, it has nothing to do with the actual cucumber itself. Think about it for a moment: if you were eating or minding your own business and then turned around to suddenly find an unfamiliar object sitting right behind you which wasn’t there before, wouldn’t you be a little scared, too? Mike Delgado, who was mentioned earlier, helped shed a little bit of light on the truth behind this subject. He explained that cats are creatures of habit, which means that they get used to their familiar tasks and activities and become upset or agitated if something disrupts their routine. Considering the fact that many of these “cucumber pranks” took place while the cat was distracted and busy eating, this theory sounds a little more reasonable than the others. Another animal behaviorist named Dr. Roger Mugford also supported this theory by saying that he thought the negative reaction was likely due to the surprise of finding a strange and unusual object suddenly placed behind them while they had their heads in their food bowls. He went on to say that their suspicion, surprise, and fear is only natural, as they would have to have these reactions to the unknown to survive in the wild. He said that the reaction would likely be the same if the cucumber were replaced with any other object that the cat was unfamiliar with. The Verdict: Don’t Scare Your Pets! You might think that the reaction is funny, but it’s anything but that to the cat being “pranked.” In fact, you might actually be causing a lot of harm by pulling this serious “prank” on your pet. If your cat begins to associate that fear and surprise with being at their food bowl, they may stop eating entirely, which is obviously not very good for the cat. Stress itself could also be a big cause of sickness. Cats are sensitive creatures and could show symptoms such as vomiting, diarrhea, or not using their litter box with even the smallest onset of stress. The fact of the matter is that surprising your cat isn’t funny; it’s awful. With that said, this doesn’t mean that you can’t introduce new objects into your cat’s life. If you let cats inspect new objects on their own terms without the element of surprise, it’ll be much easier for them to get accustomed to seeing those objects. If your cat doesn’t like an object, don’t try to force him or her to get comfortable with it, as that might only make the cat more scared. In the end, just don’t scare your cats.